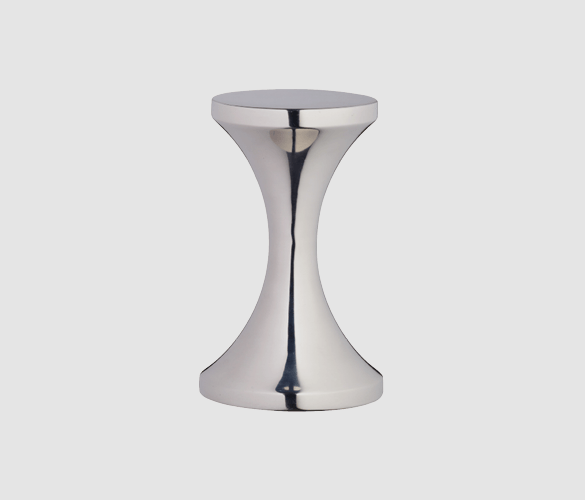 Double-ended stainless steel coffee tamper by Kitchen Kraft. This stainless steel coffee tamper is an easy way to brew consistently delicious espressos. The dual ended feature is useful for varying sizes of portafilters, with a 53mm top and 57mm base. The premium stainless steel is durable, easy to clean and is a great choice for tamping. What is a coffee tamper used for? A tamper is used to pack down or tamp coffee grounds into a portafilter. They are mostly used for brewing espressos. Usually the beans are put in the grinder, enough grounds for a shot are poured into the portafilter and then the tamper is used to compact them, so they are ready for brewing. When the grounds are poured into the portafilter, they are usually in a loose heaped pile. The tampers job is to press them down into a smooth, compact little puck of coffee. Why should I use a coffee tamper? This is a vital part of professional coffee brewing and should be a part of every baristas collection. There are so many factors that go into making the perfect espresso, such as grind size, coffee origin, water temperature and so on. But, many forget the importance of tamping and how much attention it requires. An espresso machine works by shooting pressurised water through the grounds, producing a strong and thick shot. If the water was to be forced through a loose pile of grounds, it would go straight through and barely touch the whole amount of coffee. The water finds the easiest route through, so it would simply slip through the large cracks and empty spaces. Compacting the grounds makes it harder for the water to get through and creates less space. This forces the water to further explore the compact puck of grounds and fully immerse the shot. This is much more beneficial for espresso as more flavour is pulled out and you will receive a stronger, richer and better tasting shot. What makes a good coffee tamper? Although some may think a tamper is a tamper and any will do, this isn’t always the case. The quality of your brewing equipment can have a massive impact on the final result of your cup. So, it is important to get the basics right for your brewing kit. Grounds are full of oils, notes, aromas and flavour molecules that can all be affected by what they come into contact with. Even conflicting smells can alter the taste. Porous materials such as plastic and unglazed clay can absorb flavour and affect the true taste of the beans. That is why we recommend a premium stainless steel tamper for the best results. Stainless steel is durable, easy to clean, hygienic, affordable and won’t affect the taste whatsoever. The aim of tamping is to achieve a flat even surface with a compact puck in the portafilter. This is to ensure the water evenly immerses into the grounds and pulls out all of the flavour. To get the best results and to avoid straining yourself, make sure to keep your wrist straight and your arm at a 90° angle. The push should come from your shoulder and upper arm, and not your wrist. When figuring out on how hard to press, there is no exact scientific recommendation. Instead, focus on consistency. When you find a pressure that works for you, try recreating this every time for a delicious espresso. It is also incredibly important to keep your device clean to prevent old bitter flavours from contaminating fresh grounds. An easy way to clean your tamper is by using hot soapy water in between uses.